filming Camberwick.And,apart from a brief cameo appearance in the BBC's "Future Generations"
kids' tv promo in 1998,he'd not filmed anything else since. round good-egging.It's just that it was all done sight-unseen by the rest of us. But an invitation to front an ad campaign for breakfast porridge was to change all that. And prove once again that whilst form is temporary,class is indeed permanent. It was still a surprise though.Because by this stage Trumptonshire had largely retreated to the sanctuary of dvd and the memory banks of people of a certain age.Allbeit a lot of people of a certain age. Although how much of a role they actually played in this particular coup is unclear.Because it was the ad agency Abbot,Mead & Vickers that came up with the idea,in response to a brief from Quaker owners,Pepsico. Why Windy ? Well.......an iconic kid's tv star plugging an iconic brand......promoting the virtues of healthy eating against the background of rising levels of kids' obesity..... whilst appealing to the nostalgic instincts and tastebuds of the parents needed to do the buying. 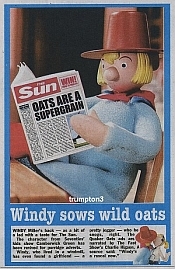 Or just a miller plugging a milled oats product,depending on how deep you want to go.Either way,Oatso Simple really. ON THIS PAGE - The full story of the 2005 & 2006 ad campaign,featuring Windy and some new friends. A. Simply because Gordon Murray insisted they retained the look and feel of the originals.And that could only be done using the same stop motion animation method. It's true that CGI can create imagery that stop-motion can't do well (or at all) And it can also be quicker and cheaper. But Murray was absolutely,100% right.And anyone who disagrees has completely failed to grasp just what an integral part stop motion played in their success. Still not convinced ? Well,how about the hopelessly misjudged CGI Magic Roundabout movie that came out in 2005 ? All the life and charm was airbrushed out of the characters.Some badly miscast voiceover celebs did the rest.And kids who hadn't seen the originals were left wondering why we loved them.Which you'd think was almost impossible.But sadly not. miniature.And CGI was only used to create the steam coming up from the bowl of porridge. Everything was hand-made by a firm of model makers over an 8 week period. The ads were critically acclaimed.Most fans seem to have enjoyed them.And Pepsico shifted some more packets. So everyone seems to have got something out of them. morphed into Classicmedia.tv. Cue tumbleweed. campaign will obviously be disappointed. The successful 2015 Clangers remake showed it can be done.......and with stop animation too. Beautifully recreated to retain all the charm of the originals,yet seemlessly coupled with the modern tweeks required. But the Clangers are timeless,and broadcasters see Trumptonshire's mix of human inhabitants as its modern day weakness.So I think it's unlikely......even less likely the longer it goes on.....and,maybe,no bad thing. Because perhaps it's better it stays as a defiant record of what was,rather than going cap-in-hand to cater for modern tastes - ? A. It was Charlie Higson (b.1958),a successful comedy performer,comedy writer and novelist. Fast Show's Ted and Ralph sketches. Click on the pic and it'll take you to his website. Brian was the obvious initial choice and was asked to test for it. Unfortunately,it probably proved just a few years too late and they decided to look elsewhere.
" I did a version of it,but they didn't think it worked.They told me it didn't sound like me.I suppose I don't sound just as I did 40 years ago,but I was very disappointed.I would have thought that the viewers would have recognised my voice." It must be slightly surreal to be told you don't sound like you but,no matter,because his immortality is assured. And it's a testimony to his indelible association with the role that Plan B was to try and find someone who did sound like him,1965-style.But,eventually,common sense kicked-in and it was decided to have a clean break rather than a poor imitation.And Charlie was the man. He was apparently chuffed to do it and is so good that you could actually imagine him re-dubbing the originals and making a pretty good fist of it. High praise indeed. A. 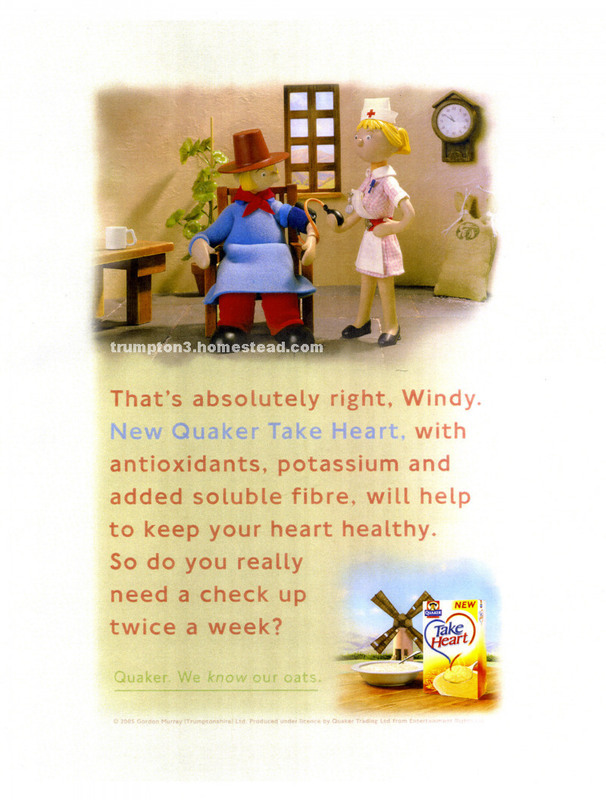 The thing about Windy is that he's just as big a brand with people over a certain age as Quaker is. And so long as he continues to dodge any direct branding altering the way he looks,then he should be ok. It's when he dresses up as Ronald McDonald that we can all say "ta,ta"
And as it was the 1st tv work he'd had in ages,then maybe we should just give the little fella a break ! A. Now there's a question. And the simple answer is I've absolutely no idea -"commercially sensitive information",as I was rather melodramatically informed. But,whatever the figure,it was loose change to someone like Pepsico.And whilst there are clearly cheaper ways to make an advert than with stop motion,it's always the consumer who ultimately decides whether it was money well spent. A. The ad agency of Abbot,Mead & Vickers,and specifically Dave Buchanan and Mike Hannett. A. Windy's a bit like Dr.Who,because he undergoes periodic "re-generations". But,unlike the Doctor,Windy is a true Lord of Time as he always emerges looking exactly the same. And if he was,say,30 (??) in 1966,he was 70-ish come Quaker time ! Anyhow,the original 1965 MK 1 version famously ended up on Gordon's back garden bonfire in 1986,along with nearly all the other models and sets.And as they'd apparently become rather tatty and the foam sticky and gooey,then we can call it a mercy killing rather than genocide. A MK 2 version was then made specially for the 1998 BBC "Future Generations" promo.Which then found a temporary home at the Toy Museum in London until it was shut down,and its current whereabouts are unknown. So this was the MK 3 super-spec version -externally no different but completely upgraded internally.A sort of Lee Majors,Six Million Dollar Man makeover,as explained in "Model Making Masterclass" below. Want to faithfully ressurrect a Nation's favourite ? You need an expert model-making company like Artem. No sticky back plastic and washing up bottles here ! And whilst you'll recognise some other familiar sounding materials in the coming paragraphs,it'll only go to prove that we can all buy eggs,but very few of us can do much more than scramble them. Bob Thorne and his team took 8 painstaking weeks to create everything you see in the ads. From the seemless recreations of all the original sets, props and characters to all the new additions,which had been designed by the animators,LooseMoose. But it's been well-documented that all the original models and sets were destroyed,so where to start ? A. There were 4 seperate tv ads. character descriptively,but simply,called "The Jogger"
new female character called "Molly the Barmaid"
A 3rd one called "Complaint",featuring PC McGarry,came out in early 2006. And the 4th one,"Uncle Guber",followed in September of the same year.Again advertising the Oatso Simple brand,only this time with another new male character,Windy's "Uncle Guber" from Norway. There was also an accompanying print ad campaign which also featured The Mayor (pic) and PC McGarry (pic),as well as a 4th new character of an un-named nurse (pic). Doc Mopp usurped ! Molly's Car isn't one bought from a toy store like Mr.Dagenham's in the original series.In fact the only similarity is that they're both red ! With Molly's being hand made from scratch -as you'd probably have guessed by now. The Tree. Yes,theee tree.Because in Trumptonshire there is only one species of tree,which helpfully removed any continuity issues of course.And more often than not it was the same plastic 'jobbing' tree that's transplanted from one location to another. Unfortunately as no off-the-shelf match could be found,it proved to be a species that's now sadly extinct. So,in the absence of any DNA, Bob took a photocopy of it from one of the books and sent it up to Scotland to be photo-etched in brass before being soldered leaf by leaf and then spray-painted.Sadly,I didn't actually think to ask why it had to be made out of brass,nor how much it cost.Although the latter is probably too frightening to contemplate. But it just typifies the whole approach.And my personal compliments to Bob and his team for a truely remarkable job. Like many a big kid,I'm a sucker for all this kind of stuff. And whilst my head tells me that the reality of being an "SFX superviser/designer" is probably far more mundane than I'd imagine,I was encouraged by Bob's genuine enthusiasm for the project to think that maybe it isn't. And it's also quite reassuring to know that we can still do some things ourselves without having to wait for it to arrive in a container from China. I'll resist the obvious temptation to throw it open to a caption competition. A representative of Entertainment Rights offered up the Harrops collection of ceramic figures as a possible reference point. But,no matter how accurate,they were still interpretations.And the finish couldn't offer any clues about the textures of clothing,the coarseness or otherwise of the paint brush strokes or the precise tones and finishes of the original colours. And,yes,we're talking that much of a no-compromise approach.And not OTT when you consider how firmly entrenched in the memory banks those original images are.Because,if the Mill was the wrong shade of pink you might not be able to put your finger on it but you'd sure as hell know something wasn't quite right. So,the dvd was obviously looked at closely.But the still photos in some of the spin-off books provided even greater definition.And as a lot of those shots were stage-managed specially for the purpose,they got the added bonus of extra views and angles not on offer in the actual film footage. In fact,some of them are so revealing that it's actually a little unkind to the original model makers frankly. The Set was 2 sheets of 10ft x 5ft MDF. Even a suggestion to create the backdrop using cgi to save time was rejected.So the sky and hills were actually hand-painted onto cloth canvas,that was then stretched in a frame and simply placed behind the animating table. The base was treated with a sort of ragged paint effect,spray-glued and then sprinkled with very fine florist's sand to create Camberwick terra firma. 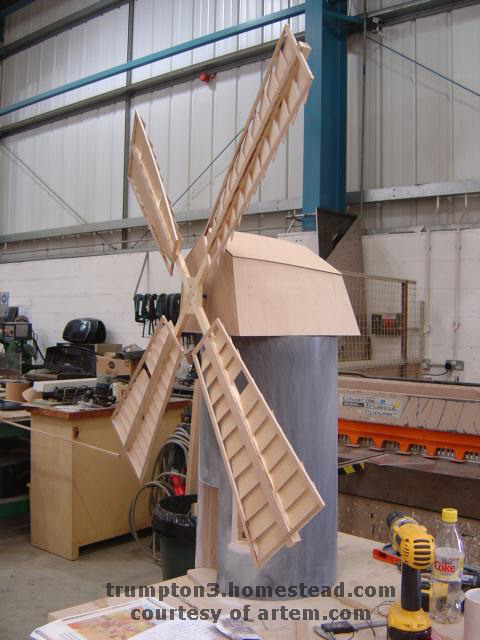 And the plants & shrubs that line the join between the horizontal and the vertical behind the Mill are real little plastic models,similar to the kind of stuff the famous toy company,Britains,used to produce. Windy,the model,is nothing short of a mechanical marvel.Forget The Terminator,I give you The Wheatgerminator ! As befits the rank of supporting cast members,The Jogger and Molly were mechanically lower spec than Windy,simply because they didn't need to be as complicated and it saved some time and money. The Jogger was a compromise between a jointed framework and a more simple basic aluminium armature.And,in fact,the latter is the same wire used to contort tree saplings into bonsai trees and perfectly sufficient for parts of the body that don't require too much animating or too much complicated movement.And as her main task was obviously jogging,the jointed bit was predominantly below the waist.Which left Molly only needing the most basic joint-free version,as the most we see her do is a quick wave from inside the car. All their foam clothing was cut to size from different coloured 8' x 4' sheets supplied by Dunlop.Not that the characters had an extensive wardrobe you understand,it's just that 8' x 4' happened to be the minimum order size. The first is a look at the production process.And the second is called "Quaker Oat Takes". That 4th ad is particularly notable for a series of Trumptonshire "firsts"
* It's the first ever appearance of anyone related to Windy. And not only Johnny Foreigner but a blooming naturist too. (blimey o'reilly,I need a lie down). * It's the 1st time in the show's history that we actually get to see inside the Mill. But that's showbiz..........or what happens when the Devil comes calling ! Just a couple of small daily newspaper articles to finish. 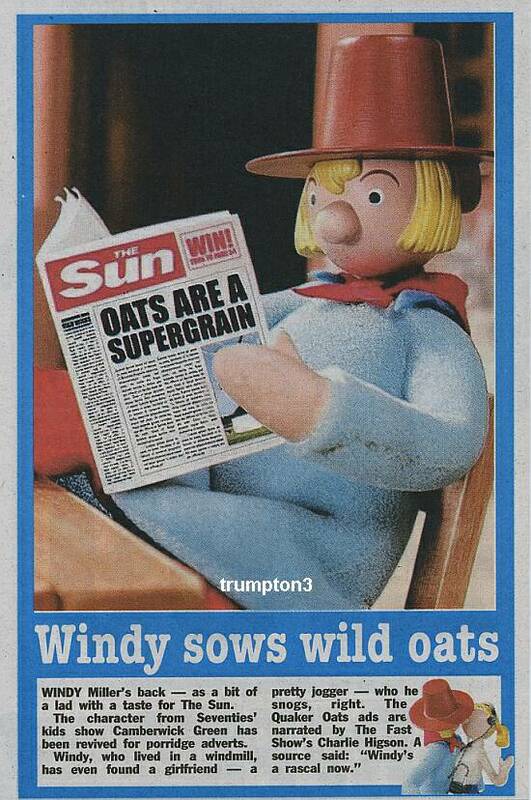 Proof positive that Windy takes a pragmatic view about most things.And that he's perfectly happy to play the Sun off against the Daily Star in search of a bit of publicity. Typically low-brow stuff,but you've got to play the game if you want the column inches.